I recently purchased a few e-books on the subject of DIY home solar power systems, one of them being Ben Ford’s Homemade Energy Guide (more information can be found at www.homemadeenergy.org). My first impression of Ben Ford’s solar panels construction e-book was fairly positive – in addition to his main web site is presented in an immaculate and professional manner, his manual has also been featured in popular publishing media outlets such as Popular Science and Popular Mechanics. Ben Ford is a 52-year-old “average Joe” from California. However, one thing sets him apart from the usual Californians: rather than paying the utility company for electricity usage, the company is paying him! How does he do it? Unlike the traditional set-up, Ben’s home system utilizes renewable energy sources such as solar and wind power. When this natural energy generated is greater than the net consumption of power needed to run his household, he sells the excess energy credits back to the utility company. Smart, isn’t it? 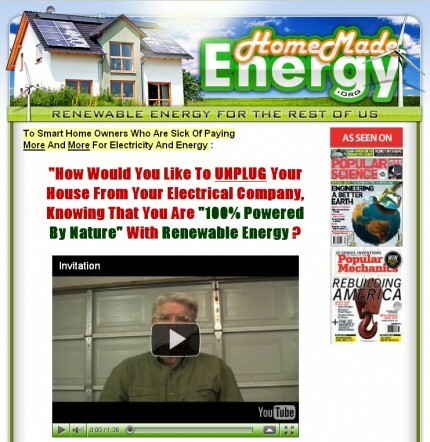 In his e-book the Homemade Energy Guide, Ben teaches readers how to live off the grid and get the electricity company to write you a check each month, rather than the other way around. According to Ben, the solar system can be set up for less than a mere $200. As with other renewable energy guides available online, this small budget is intended for systems that use only one solar panel. Based on my personal research, a homemade solar panel is typically capable of generating approximately 18 volts and around 75 watts of DC (Direct Current) electricity. Based on these findings, how much should one expect to spend on a complete solar power system capable of meeting the average consumption in a household? The answer: Be prepared to invest upwards of $1000. Where do all of these extra expenses come from? Keep in mind that in order to have a complete working system, one must purchase other solar components such as meter gauges, charge controllers, deep cycle batteries, power inverters, and so on. The main cost of the system lies in the battery bank. If a household uses a myriad of various electrical appliances that require a lot of power to run, a larger battery bank may have to be constructed to make up the difference and support the energy requirement. A larger battery bank equals a higher cost. In any case, a residential solar power system that costs around $1000 is still much more affordable compared to a system installed by a professional solar energy contractor. The bill for engaging a contractor can easily cost upwards of $40,000 or more! However, if you are looking for ways to reduce your home electricity bill and are interested in greener energy sources, exploring the idea of using solar or wind energy may be of interest to you. If you are the builder type and want to save even more money, research the Do It Yourself (DIY) route. One only needs to be proficient with hand tools to be capable of building a system of their own – a design blueprint and a step-by-step manual is all that is needed to get started. If you are looking for a decent instructional manual available on the web, check out Ben Ford’s solar panels Homemade Energy Guide – if you are not satisfied, the e-book comes with a 60-day money-back guarantee. ==> Click here to visit Ben Ford web site now! I have written several emails to Ben Ford about not getting the free stuff he mentioned in his emails about refurbishing batteries and he has never answered me. I think he’s recommending a scam. Hi Ron, which email address did you send to? I would like to say that I have asked Ben few questions over emails and he always got back to me within less than 24 hours. Hi Howard, what’s your Clickbank purchase receipt number?